Choosing the entertainment for your event is a very important decision. How can you tell for sure if one DJ service is different from the others? Will they do what you want, or will they show up and do their own thing or take your event seriously and perform the way you want? Here are some of the most requested questions and answers that have been important to our clients. Please make sure you call us with any questions and concerns that you have regarding the entertainment for your party. 1. How do we know that you will provide the service that we really want? We listen! All of our events have extensive planning forms created to allow you to plan your party, the way you want it to be. Our full-time event coordinators will personally assist you ahead of time on the phone or in our office to go over all of the music details, event details and planning to ensure that we provide you just what you envision. We love happy clients and work hard to keep you happy! 3. Other DJs will meet us at our home, or a coffee shop to discuss our wedding, will you? As convenient as that may seem, how can you really tell if they are a legitimate service unless you visit their place of business? Most of these DJs do not have an office, or any real commitment to their ‘profession’. Instead of treating our DJ business like a hobby, we run our DJ Company from our Offices. We invite you to our offices to meet with us and plan your event. We are located one minute from Hwy 99 in South Surrey at the beautiful Pacific Inn. Our office is open Monday – Friday 10:00 till 4:30. We are also available to schedule after hours appointments. 4. May we or our guests make requests? YES! We welcome your pre event music requests. We also encourage your guests to approach us with their dance song requests at your event. Our charismatic DJs love to be engaged with your friends and famly throughout the entire event. You will also be able to include a “do not play list” for those songs or music styles that you do not want played at your event. We are proud to offer the most extensive music library in the Vancouver area. Click here to check out our Music Library. 5. How will your DJ be dressed? Our DJ will always be dressed appropriately for your event. For most weddings and corporate events our DJs will be in a suit, or shirt, tie, and jacket. We would never want our DJs to dress in a manner that draws more attention to us than to you. As well, there may be events where you want your DJ in a tux, or in jeans, or dressed specifically for your occasion, just let us know. 6. Are your DJs experienced at weddings? Yes. 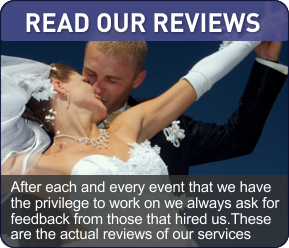 Our wedding certified DJs are very knowledgeable, and experienced with performing at weddings. With so many concerns about the details of your reception, you can be assured that your Garry Robertson DJ Entertainer has many years of wedding experience. 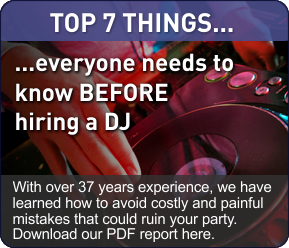 The average experience of our wedding DJs is from 10-15 years, all the way up to 20+ years. You will always have a Wedding Approved and Certified Garry Robertson Wedding DJ at your wedding ceremony and reception. 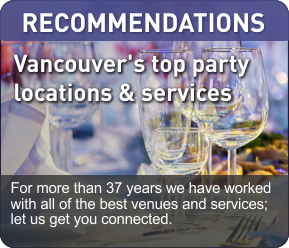 Our outstanding service is how we built our reputation as the most requested DJ service in Vancouver! 7. Do you use professional equipment? Yes. Each DJ on our team has mobile sound equipment of the highest quality that can provide crisp, clear digital sound and volume appropriate for your group. We upgrade our DJ equipment on a regular basis. We can also provide the right equipment to handle any sized event at any sized venue … yes, even BC Place! 8. Do you provide an emergency back-up system? Yes. Not only do we have back up equipment on site at your event, we have a back up DJ on call the night of your event. Our back up DJ is paid to be on call that night, and has our emergency cell phone with him. In the unlikely event that something should go wrong we have backup ready to go! In over 37 years, we have always come through at an event. Of course! We carry $2,000,000 liability insurance. Additionally all of our DJs are covered under B.C.’s Work Safe Program (WCB). If you’re hosting a party, you can be assured that we are covered. When you are working with a real, legitimate DJ company, you better believe you are covered! 10. You say that you are the most recomend service in Vancouver. Where do your referrals come from? Our referrals come from past satisfied wedding customers, corporate clients, and vendors such as photographers, banquet facilities managers, hotels, and event coordinators. In fact, most of the 15,000+ events that we have had the pleasure of performing at over the past 37 years have been by referral. Garry Robertson DJ Entertainment is the most referred DJ service in Vancouver for this one important reason … We do our job RIGHT! With no last minute surprises!